This is the gate that leads into the training fields. 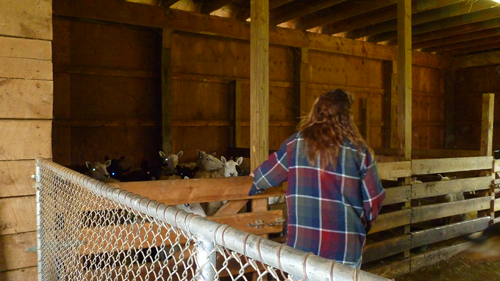 WORKNGSD FACILITIES FAQS: Our barn is 30′ X 40′ with an indoor working area of around 30′ X 20′, with 10′ X 10′ stalls available for up close work. 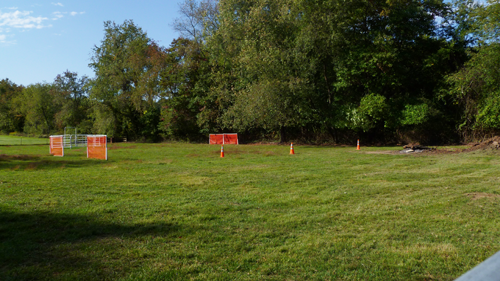 We have both a 20′ X 40′ take pen, and 70′ X 80′ pen available, and two fenced fields of 190′ X 100′ and 260′ X 225′. 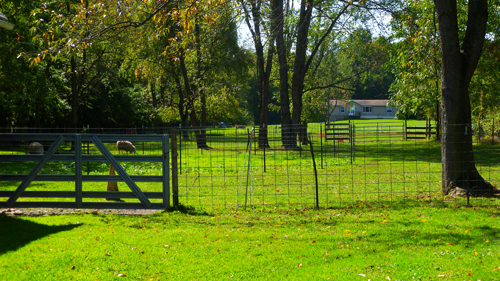 Bordering these fields, we have access to many unfenced acres with wooded and pasture areas and a creek. There is also a 20′ x 40′ inground pool available (in season) for Therapeutic Swimming and Dock Diving lessons. Our livestock is made up of approximately 35 Cheviot and Cheviot-cross dog broke sheep ranging from heavy to light, which have experience working with a variety of herding breeds. 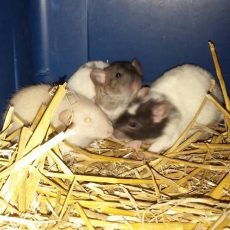 Stock rentals are only available to experienced handlers. 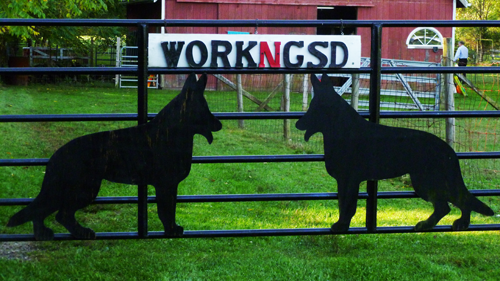 WORKNGSD RENTAL FAQS: We have livestock and facilities available for rent for all types of events, whether for non-competitive events such as Fun Days and Mock Herding Trials, or for practice runs and mock competitions such as Weight Pulls, Dock Diving, Tracking, or Carting events. We are also available to host National or Specialty Clubs’ competitive trial events. Contact us to see if you or your organization has a livestock or facilities need that we can accommodate here at WORKNGSD. This is a view of the fields behind the barn. This is a view of the back field. 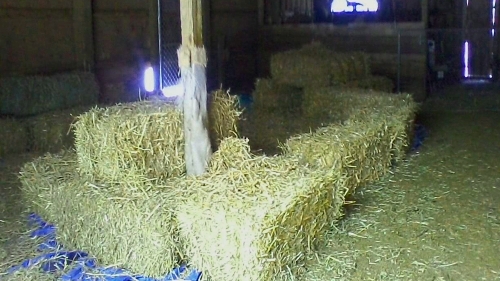 This is a view of the inside of the barn. 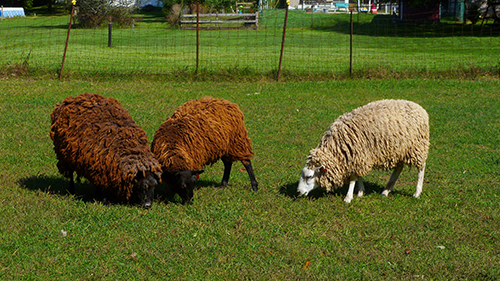 This is a view of some of the WORKNGSD flock. 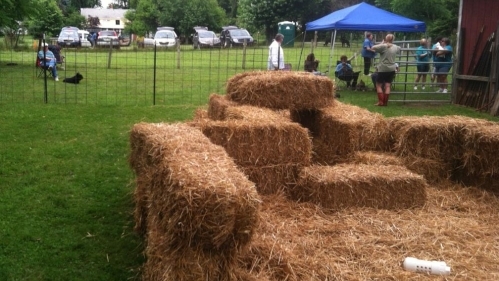 This is a view of one of our outdoor practice Barn Hunt events. This is a view of one of our practice Barn Hunt events in the barn. 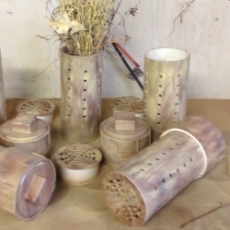 John and Bob did a great job with the camouflage paint on the plain white tubes that house the rats so they don't get hurt! 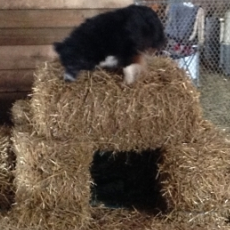 Christine Ravetta's Aussie, Ruchi, loves herding and is also doing great finding the rats at our Barn Hunt practice!